“As an artist I find that social networking technology is ontological.” -Andres Manniste on Nettime, March 2008. As we use the web we construct a portrait of ourselves over time: what sites we return to, what blogs we reference, what photos and videos we post, what cross-alliances we form, what written traces we leave. In a culture as heterogenous as this one, we are what we consume, especially online. New media scholars such as Hugo Liu are already conducting demographic studies that trace “taste fabrics” from SNS preference lists. Taste fabrics are a “rich tapestry of interconnected interests and identities,” used variously to assert prestige and to differentiate a profiler from her peers. SNS can reveal how taste trends seep into art practices and weave into pop culture and back, defining an era or a particular artistic movement. The practice of art will be influenced by the rapidity with which tastes are being swapped, exhibited, and performed online, and SNS plays a role in this. Historians and theorists will have to contend with online ontologies, and SNS – along with artists’ websites and blogs – will be a future site to mine for a more coherent picture of a particular artist’s practice. An example of this recently is Ryan Trecartin, video art’s enfant terrible of youtube, whose work came to gallerist’s attention via his extensive youtube page. But beyond the utility of social networking sites as platform for taste-swapping or self-promotion, artists use SNS as a medium in its own right, spawning new genres of art practice and tactical web 2.0 critique. While SNS is made to be used as a multi-purpose tool, taking the software cloud as a given, artists can use this rigid language of these sites in the same way early filmmakers tampered with the materiality of film, by punching holes in the code Brackage-style, and sometimes spawning new genres altogether. By playing with software as a medium, these artists make creative ruptures that expose SNS construction. Kevin Killian, a San Francisco poet, for example, uses Amazon reviews – he’s written 2219 of them to date – as a kind of autobiographical fiction, a few of which were compiled and published by Hooke Press. David Horowitz invites collective experiments with image labeling in SNS, resulting in bizarre flickr categories. One project calls for people to take photos of their heads inside freezers and label them cryptically ‘1070643’. Other artists are appropriating SNS vernacular, such as Ola Vasiljeva’s video “Joan Miro” that makes surreal use of youtube bubbles. And in “winning_information” the Dutch duo known as JODI used del.icio.us to build a formalist structure that confuses the function of the web’s visual languages. There are over 150 SNS, including business hybrids and non-profits such as craigslist, but many of the most popular sites are corporate owned with suspicious privacy policies. Given that corporations from McDonalds to Burberry now have a facebook page, a contingent of artists use SNS to subvert potential exploitation and control by such sites. Creative hacktivists or tactical artists reveal and upend online surveillance by profit-driven SNS. Here are only a few – it would be great to find more. Denton Police Tweetpics was programmed by a University of Northern Texas photography student to draw attention to how much public information goes online. subvertr.com is a parody of flickr by Les Liens Invisibles. Their ‘about’ page warns, “Don’t let anyone else put the hands on your imaginary. We want to help people manipulate their imaginary. Just subvertize and manage it by yourself: collect, detourn, alter and share it with other people like you!” And Christopher Baker created Murmur Study as a material equivalent of the amount of information we submit to twitter, facebook, and tumblr. 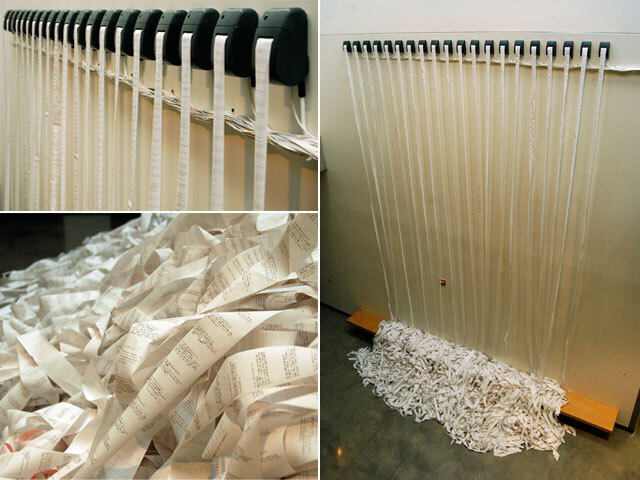 30 thermal printers print variations on emotional utterances (argh, grrr) onto an endless cascade of receipt paper. The video is on vimeo. Many examples on artists and social networking came from rhizome.org and the exhibit Tag ties and affective spies, curated by Daphne Dragona for the National Museum of Contemporary Art, Athens. This blog could be a nice example of an artist collecting images on the web. He also published a book. Twitter Poetry and Mobility in Art « . marta and the rubik's cube . « Does the Flickr ‘style’ manifest a longing for a non-technological authenticity?